As you determine which medical uniform rentals are best for your team, consider the many ways in which high-quality medical uniform rentals can benefit both your team and your budget for the upcoming year. Clean facilities and sanitized equipment are especially crucial in the medical field. With this in mind, it is also essential for medical employees to have access to clean and well-maintained uniforms on the job. What better way to display the professionalism and cleanliness of your medical staff than with excellent medical uniforms for your employees? Ensure the well-being of your patients with a sanitary care facility and professionally maintained scrub rentals for your team of medical professionals. 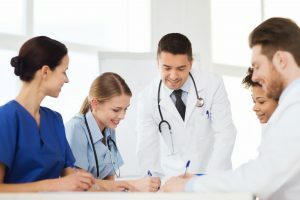 As you determine which medical uniform rentals are best for your team, consider the many ways in which high-quality medical uniform rentals can benefit both your team and your budget for the upcoming year. Because so many patients often form an opinion on a hospital or medical facility based on the cleanliness of the facility, it is crucial to also uphold this standard of cleanliness in the appearance of your team. With professionally maintained medical uniforms rentals such as scrubs and doctor coats, your patients will notice your efforts to maintain a clean and professional practice. Scrubs and other medical uniforms are exposed to a significant amount of wear and tear over time. With this, these uniforms may start to look worn out without the proper maintenance. Poorly maintained medical uniforms may lead patients and families to form negative opinions about the cleanliness and professionalism of your medical facility, as these impressions are often tied to their anticipation of the care that they will receive in your practice. By renting your medical uniforms with Lord Baltimore, you can ensure a professional appearance of your uniforms with professional maintenance offered by Lord Baltimore. This step allows each uniform to be professionally cleaned and maintained with a significant amount of attention to detail. Irreparable uniforms are replaced with a fresh set for your team to use at all times. This simple step can reduce the managerial stress of uniform maintenance for your team throughout the year. The costs of replacing worn out medical uniforms can become a major expense for medical facilities. For this reason, managing your costs with uniform rentals for your team is an excellent way to eliminate the stress of replacement and cleanings. Medical uniform rentals are also a convenient solution for medical facilities with high turnover rates or a rapidly growing team. This entry was posted on Thursday, October 4th, 2018	at 10:43 pm	. You can follow any responses to this entry through the RSS 2.0	feed. Both comments and pings are currently closed.